Secondary (Artificial) Defects of Timber. Defects in timber may be defined as, any undesirable character -natural or artificial- that lowers its strength, durability or quality. Defects in timber are generally distinguished as natural defects and artificial defects. This group includes all those defects: (from an engineering point of view) that are developed in a tree during its growth. Their development, therefore, cannot be controlled by man. Most common natural defects are: knots, shakes, cross grain, crookedness, rind galls, burr, and curl. A knot marks the position of growth of a branch on the tree. On the cut board, it is most easily marked by its conspicuously darker appearance and harder character. A knot is essentially a discontinuity in the timber and hence a place of weakness. Knots show great variation in their size, shape, and stage of development. A few common types of knots are pin knots, small knots, medium knots and large knots. This distinction is based on their diameter, which is, respectively less than 6.50 mm, between 6.50-20 mm, between 20-40 mm and larger than 40 mm. Similarly, on the basis of shape Knots may be described as rounded, oval and spike knots. On the basis of their mode of occurrence, we may classify them as single knots, knot clusters or groups. Knots may also be distinguished into a tight knot and a loose knot, and so on. (i) Live Knot: It is that part (root) of the branch that becomes completely enclosed within the growing trunk of a tree. In such a knot, there is complete structural continuity between the fibers of the branch and the main tree. (ii) Dead Knot: In such a knot, the continuity of structure is almost lost or is only up to 25 percent. (iii) An Inter-grown Knot: This is the term used when almost three-fourths of the fibers of the knot (perimeter) show continuation with the main tree. (iv) Encased Knot: It is a knot surrounded entirely by bark. (v) Edge Knot: It is seen only in saw-on timber, on one edge of the cut portion. (vi) Face Knot: It is also seen on cut timber on the face of the board. Firstly, they make the workability of timber quite difficult. They are harder and offer greater resistance to planning and polishing. Secondly, they reduce the tensile strength of the timber. Compressive and shear strength are, however, not affected badly. After knots, shakes are more serious and common defects in timber. freezing of sap in the cells during its ascent. Heart Shakes: These are cracks or clefts occurring in the heartwood, i.e., towards the inner region. They indicate the beginning of decay of the tree. They become thinner as they extend outward (towards sapwood). 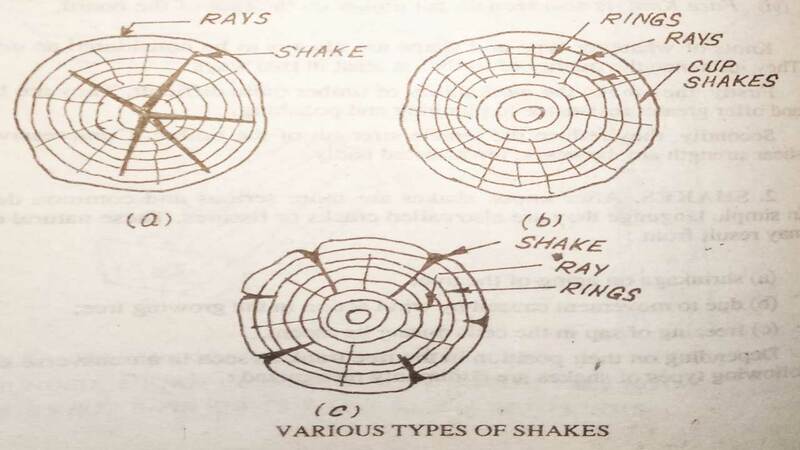 Star Shakes: They are also called radial shakes. They generally arise in the sap wood and extend towards the inner regions. Hence, these are wider in the outer regions and become narrower as they pass inwards. The main cause for their development in a living tree is severe temperature difference during different seasons, such as excessive heat during summer, and severe cold, leading to frost formation in winter. Cup Shakes: These are also called ring shakes. These are cracks that develop parallel to the annual rings. As such, when fully developed, they may separate portions of timber longitudinally along the rings. But this condition is seldom seen. Generally, they develop along a part of a particular annual ring. Reasons for development of cup or ring shakes are to be sought in the unequal growth of the timber. The most important effect of the shakes on the timber is that these reduce its resistance to shear considerably. As such, it is necessary to avoid the use of timber containing shakes where severe shear stresses are involved. Another effect is that shakes allow an easy access of moisture and air to the interior of the tree along with insects and fungi. This reduces the durability of the timber. As said earlier, fibers of the wood in a normal tree are usually parallel to the axis of growth (length of timber). This structure is called straight grained. In some cases, however, these fibers are not straight; they make an angle or slope with the axis of the tree, the structure is then called cross-grained. In fact, a minor slope (of grain) may be seen in most trees. It may be quite harmless. The slope of grain becomes harmful (or a defect) when it exceeds specified limits. This is because the strength properties (especially compressive and tensile strength) are closely related to the direction of the grain vis-a-vis direction in which the load is applied to the timber. 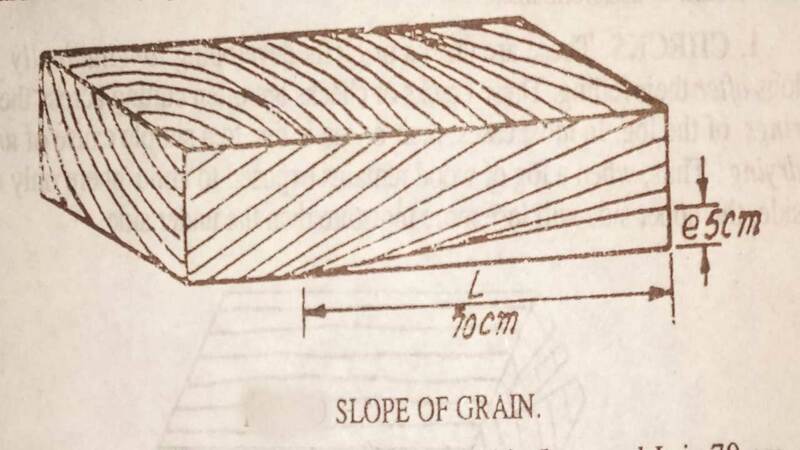 Slope = e / l.
Where “E” is the maximum height (above a reference plane) of a reference grain or fiber, and “L” is the length along the same plane where the same fiber meets a horizontal line. In the accompanying figure, for example, ‘e’ is 5 cm and ‘L’ is 70 cm. So, the slope in this particular case is 1 in 14. (5/70). It is desirable that the slope of the grain should be well within the allowable limits for different grades of structural timber. Overgrowth of timber in some parts or a tree may result in some typical defects. A rindgall is simply a highly thickened, enlarged wood cover developed over an injured part of the tree. It is a defect in timber because it will have to be removed first of all for conversion of the tree. Burr and Curl are generally developed as thickened overgrowth on junctions between the tree trunk and a branch or between one branch and another branch. Such overgrowths commonly result in severe twisting of fibers in the board cut from this portion. Read More: What is Bearing Capacity of Soil? & How to improve it? In the growing trees, strong winds commonly cause ‘shaking’ of the standing trees again and again. As a reaction to such wind action, wood in these trees develops additional strength in those parts where the bending action is most severe and repeated very often. In other words, within a tree, there may be zones of normal wood and also zones of exceptionally strong wood. 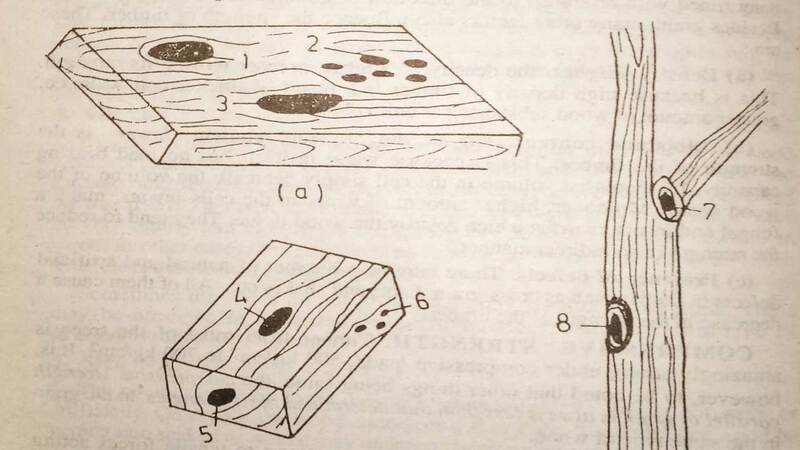 These zones of reaction wood are further distinguished in tension wood and compression wood depending on which side of a bending tree they have been developed. The reaction wood may also develop cracks. Such wood will be very difficult to work with for conversion to any useful parts. These include such defects of timber that develop in the timber after its felling and conversion to different sizes. These are cracks or clefts developing longitudinally in the logs after their felling. These cracks or checks are often cutting across the annual rings of the log. In most cases, their origin is due to a simple cause of unequal drying. Thus, when a log of wood remains exposed to the atmosphere only on one side, the upper side will lose more moisture than the under side. This will result in a shrinkage in the exposed region to such an extent that tensile forces sufficient to cause a crack or cracks in the wood will be easily developed. The development of such checks could be avoided by changing the position of the timber log at regular intervals. This will ensure uniform shrinkage which will not allow the checks to develop. The effect of checks on the quality of timber is that they reduce their strength on the one hand and allow the moisture to seep in on the other hand. 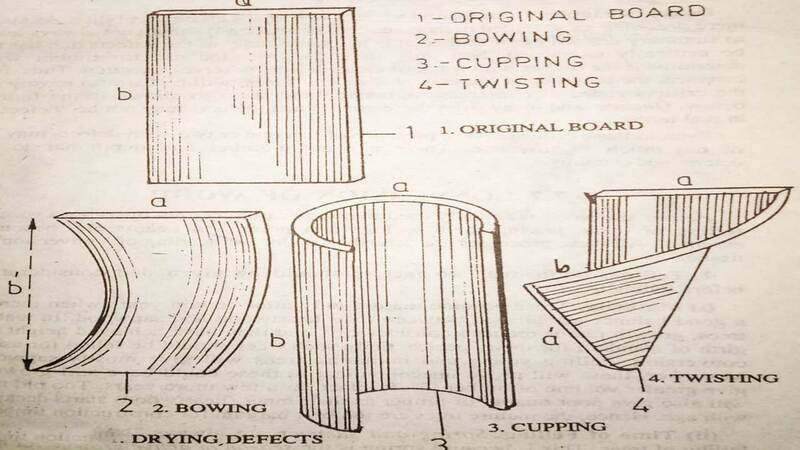 Warping is defined as a deformation in the original plane surface of a board cut from the timber. This is also attributed to ‘unequal’ shrinkage. It is most commonly developed in those boards that are cut from green or ‘unseasoned’ timber. (i) Bow: It is a curvature of the board developed in a longitudinal direction. The thin board takes shape resembling a bow. (ii) Cupping: It is a distortion developed transversely. Length of the board remains unaffected, but the width suffers distortion. (iii) Twisting: It is a complex type of distortion in which one end of the board is so much distorted that it comes to lie over a part of the other edge. The above distortions may be developed wholly or partly depending upon the thickness of the board and also on the extent of drying. Read More: Preservation of Timber and Wood. Its Methods, Causes. Read More: Chain Surveying: Its Procedure, Instruments, and Principles.